After two successful editions, AgeingFit will come back to Lille on 29th and 30th January 2019. AgeingFit it is the first international business convention dedicated to health innovation in the field of the Silver Economy. [Read more…] about Ageing Fit Lille will take place on 29th-30th of January 2019! 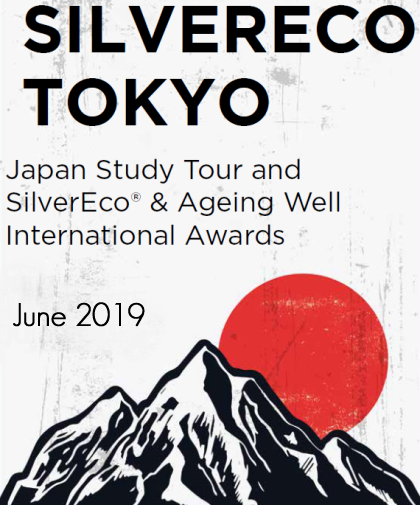 From Tuesday 11th to Saturday 15th of June 2019 a unique tour to discover the Silver Economy “made in Japan” is organised on the occasion of the SilverEco and Ageing Well International Awards. The Ageing Well Japan Tour is aimed to CEOs, senior executives and facility managers who would like to gain an insight into japanese innovative elderly care industry and services for their organizations. Attendees will come away from the study tour with a strong understanding of the financial, technical and cultural aspects that place Japan ahead in its adaptation to the global demographic ageing. [Read more…] about Don’t miss SilverEco Tokyo: The Ageing Well Japan Study Tour! The launching event of the French-Japanese cooperation on Innovation and Digital Economy took place at Station F, Paris, on July 13th 2018. It was organised by the French and Japanese governments and JETRO, a government-related organization that works to promote mutual trade and investment between Japan and the rest of the world. A new Ageing Fit convention will take will take place from January 29th to 30th 2019 in Lille, France. The event features a 360° approach to build innovation partnerships for the senior care market. Discover the AgeingFit final programme! AgeingFit, the leading European business convention dedicated to innovation in the healthy ageing sector, will gather main actors in the innovation cycle from research to market, along with the key players in regulation and evaluation with the objective of identifying tomorrow’s market needs and promoting today’s innovative products and services for the senior care market. AgeingFit will take place on 6th and 7th February 2018 in Nice (France). Discover the final programme! [Read more…] about Discover the AgeingFit final programme! SilverEco and Ageing Well International Awards 2018: apply now! The Silver Economy and Ageing Well International Awards will take place in Paris on the 29th of March 2018 during the biggest Silver Economy French event: the Silver Night! More than 1.500 professionals and business stakeholders will meet to exchange and discover the best ageing-well and Silver Economy innovations. Applications are now open! Don’t miss your chance, apply now and you may be the next winner! [Read more…] about SilverEco and Ageing Well International Awards 2018: apply now! After a successful first edition, AgeingFit, the European business convention dedicated to innovation in Silver Economy and Health, will take place on 6th and 7th February 2018 in Nice (France). AgeingFit is the meeting point for companies, scientists, financers and directors of retirement, nursing homes and hospitals from the Silver Economy and Health sector. AgeingFit offers those actors a frame so as to collectively develop innovative products and services for the prevention, treatment and support of the effects of ageing on seniors. The CES 2018 will run Tuesday, January 9 through Friday, January 12 in Las Vegas, NV. CES 2018 will touch every major global industry, hosting 3,900 exhibitors, and drive the ever-evolving technology landscape across 2.5 million net square feet of exhibit space. Only 11 days left before the Verklizan Innovation Day on November 29th 2017! Save the date : only 11 days left before the Verklizan Innovation Day, on November 29th 2017! The Verklizan Innovation Day is an international symposium for social alarms, telecare and telehealth offering a global overview of what the sector and its fields of activity are expecting in the future. As each year, Verklizan will inspire more than 280 participants with its innovations, the interactive exchanges and the exclusive ambience. [Read more…] about Only 11 days left before the Verklizan Innovation Day on November 29th 2017! The 4th China International Silver Industry Exhibition will be held from November 16th to 18th, 2017 in Guangzhou, China (Poly World Trade Center Expo). 10 days to book for AgeingFit 2018 with the early bird offer! Haven’t registered for the 2nd edition of AgeingFit yet ? You can still benefit from an exclusive discount on your full pass! This offer is valid until 16th October 2017. Reminder: the next edition of AgeingFit will take place from 6th to 7th February 2018 in Nice, France. [Read more…] about 10 days to book for AgeingFit 2018 with the early bird offer! World Alzheimer’s Day, September 21st of each year, is a day on which Alzheimer’s organizations around the world concentrate their efforts on raising awareness about Alzheimer’s and dementia. November 14th and 15th 2017: save the date for Silver Economy Expo! Silver Economy Expo, the senior citizens industry trade show, will take place on November 14-15, 2017 in Paris (Porte de Versailles). This BtoB trade show will bring together all the major players of the senior citizen industry and will be an opportunity to exchange in the same place and in a short of time with all the major players of the Silver Economy sector. [Read more…] about November 14th and 15th 2017: save the date for Silver Economy Expo! AgeingFit, the 1st European business convention dedicated to innovation in the healthy ageing sector, will take place on February 6-7, 2017 in Nice. Don’t miss this event which will gather all actors in the innovation cycle from research to market, along with the key players in regulation and evaluation ! Carers Australia will host the 7th International Carers Conference in Adelaide, South Australia, from 4-6 October 2017. This event aims to re-imagine caring into the future, providing a catalyst for innovation and collaboration; sharing improvements in the way we support unpaid carers, care-recipients, their families, networks and communities. A giant public pillow fight will take place in the heart of Luxembourg city, on the 2nd of September 2017. Bring your pillow and let’s fight to support patients in their fight against Parkinson’s disease. This pillow fight is organized by the National Centre for Excellence in Research on Parkinson’s Disease (NCER-PD), the Luxembourg Centre for Systems Biomedicine (LCSB) and the Rotary Foundation. The Alzheimer’s Global Summit will take place on September 18-22, 2017 in Lisbon, Portugal at the Champalimaud Foundation with the support of the Queen Sofia Foundation. SilverNight/French Silver Economy Awards: applications are now open! The 10th edition of Silver Night/French SilverEco Awards 2018 will be held at the Grand REX in Paris on 29th of March 2018. The applications to the awards are now open until 23rd February 2018, at midnight. [Read more…] about SilverNight/French Silver Economy Awards: applications are now open! The world’s biggest seniors fair, 50 + BEURS, will take place from the 19th to the 23rd of September 2017 in Utrecht (Netherlands). Innovative City will take place in Nice from July 5th to July 6th, 2017. This territorial innovation meeting will allow actors to understand better the values ​​of innovation. The last edition brought together more than 3,300 participants and 22 delegations representing the 5 continents. Get ready for the International Silver Economy meeting 2017! If you are part of the Silver Economy ecosystem and if you offer innovative products and services dedicated to elderly people, it is still time to apply for the International Silver Economy meeting, organized by Business France, which will be presented on Thursday, June the 29th 2017. This contest will highlight the innovative companies of the sector and will award those who have more potential in the international. > Apply for International Silver Economy meeting ! [Read more…] about Get ready for the International Silver Economy meeting 2017! The 11th European e-Accessibility Forum will take place on Monday, June 19th, 2017 in Paris. It seeks to explore the role digital technologies can play in ensuring our cultural landscape is inclusive. How can digital access empower disabled audiences and enable them to become full participants in cultural life? The Paris Healthcare Week is the major annual meeting dedicated to professionals working within the French health ecosystem. It will take place from the 16th to the 18th of May 2017 in Paris Expo, Paris, France. ICFSR Congress 2017: discover the program! The 2017 International Conference on Frailty and Sarcopenia will take place from April 27th to April 29, 2017 in Barcelona, Spain. During this event, some important clinical and drug trials will be presented. Discover the program! [Read more…] about ICFSR Congress 2017: discover the program! AARP’s Innovation@50+ LivePitch event is a two-day pitch competition for emerging startups in the caregiving technology and financial technology sectors. It will take place Wednesday, April 12 and Thursday, April 13, 2017 at the Computer History Museum in Mountain View, CA, and will include keynotes, featured speakers and panels of various thought leaders from around the globe with focus on innovation for the 50+ market. “Growing the EU Silver Economy: a workshop on policy recommendations” is a free one-day workshop which will take place at the European Commission premises in Brussels on the 8th March 2017, from 10 am to 4 pm. The workshop is organised as part of a European Commission project on the Silver Economy. The first edition of MedFit will take place from 28th to 29th of June 2017 in Grenoble, France. Gathering 500 attendees from research to market, MedFit is the 1st European business convention dedicated to innovation partnerships in the fields of medical technologies and diagnostics. Save the date! NutrEvent, the European meeting place for business innovation in food, nutrition and health, will take place in Lille, from 14h to 15th June 2017. CHINA AID 2017 will take place from Wednesday 6th to Friday 9th June 2017 at the Shanghai New International Expo Centre (SNIEC) in Pu Dong. It is the must-attend event for growing businesses in the fast-developing senior care industry in China, providing foreign companies currently establishing their presence with serious business opportunities. IANA 2017: discover the program! IANA 2017 – 12th International Academy on Nutrition and Aging on “Nutrition and maintaining functions with aging” will take place on Sunday 23rd July, 2017 (during the IAGG2017 World congress) at Moscone Center West, San Francisco, USA. Discover the program! [Read more…] about IANA 2017: discover the program! The 3rd International Conference on Information and Communication Technologies for Ageing Well and e-Health (ICT4AWE) will take place on 28-29th April 2017, in Portugal. The conference aims to create a meeting point of researchers and practitioners that address new challenges in Information and Communication Technologies for Ageing Well and e-Health. As the world’s ageing phenomenon becomes a worldwide challenge, there are numerous projects or initiatives which are being imagined in order to better cater to the lives of ageing seniors citizens. 2nd and 3rd February 2017 : AgeingFit : discover the program ! AgeingFit, the first European business convention, will take place on the 2d and 3rd of February 2017, in Lille, France. It will be dedicated to healthy ageing innovations. AgeingFit features one-to-one meetings, conferences and roundtable discussions, exhibition and innovation pitches. AgeingFit responds to the growing need for advanced products and services for the senior care market. Discover now the programm ! [Read more…] about 2nd and 3rd February 2017 : AgeingFit : discover the program ! For 50 years, the CES has been the biggest annual consumer electronics event organized by the Consumer Technology Association (CTA). The next edition will take place from the 5th to the 8th of January 2017 in Las Vegas (USA). The European Summit on Digital Innovation for Active & Healthy Aging will take place in Brussels from December 5th to 8th 2016 ; it will bring together business leaders, national and regional ministers and authorities, global “thinkers”, the investment community, healthcare, technology companies, civil society and media. Save the date : only three weeks to Verklizan Innovation Day, on November 7th 2016! Save the Date : the 2016 edition of the EAHSA’s (European Association of Home and Services for the Ageing) European conference will take place on September 22 and 23. This year’s conference is organized by EAHSA member FNAQPA. The second Silver Day Normandy will take place on Thursday October 13th ; the event is dedicated to the Silver economy and organised by Normandie’s Chambers of commerce and industry, as well as the region’s development agency. The National ‘Digital, Training and Healthcare’ Day will showcase new digital tools for health professionals and patients, as well as new advances in preventive healthcare for the general public for the first time on Thursday June 30th from 9 am to 4 pm at the House of Human Sciences in Saint Denis, near Paris. The summit on global robotics unveiled a new organization, setting out on a tour of Europe in order to get even closer to key players in the sector. First stop: The Docks de Paris, where the upcoming edition of Innorobo will take place on 24, 25 and 26 May 2016 in the French capital. On 26 – 27 April 2016 it will take place in London the Smart to Future Cities and Urban IoT. On its 5th edition, the event will attract over 350 senior level city players, representing 162 cities across 59 countries. China International Senior Services Expo (CISSE) is the biggest Chinese expo focusing on elderly care. This fifth edition will take place at the China National Convention Center in Beijing, from 3rd to 5th may 2016. The main theme is “Better care for the elderly, better life for the world”. The increasing life expectancy leads to a higher demand regarding new and up-to date treatment methods. MEDICA is one of the biggest expositions in the medical field worldwide, presenting new medical discoveries and technologies. For the next decades to come, the share of global population aged 60 or more is likely to rise to historically unprecedented levels. According to the latest estimates, by 2050 there will be 2 billion people aged over 60 ( which represents 22% of world population). The Second World Congress on Healthy Ageing (WCHA) will be held in South Africa from July 30th until August 2nd, 2015 at the Sandton Convention Centre, in Johannesburg. It is Africa’s leading multi-purpose exhibition and convention centre. The Second Edition of the International Silver Economy Business Meeting (RISE in French) will take place on Wednesday, 24th of June in Paris. Accessible Theatre is a project led by Vodafone Spain Foundation, Aptent Soulutions and the Psychiatrical Association New Life. It aims to make theaters more accessible by creating a special adapted environment for all, especially for people with visual or hearing impairments.The program started in December 2011 and ever since, more than 100 theatre plays have been adapted. The 17th edition of the French Exhibition for the Elderly (French – Salon des Seniors) will take place on April, 9th to 12th, 2015, at Porte de Versailles, Paris.